I have never really been a huge pâté fan; the idea of canned meat has always kind of freaked me out. However, falling heads over heels in love with a Bosnian man will have you trying meats and dairies you never dreamed you would try… and enjoying them. There are a couple of amazing Bosnian pâtés that I can and have eaten with a spoon by myself while listening to some Tegan and Sarah. No shame. However, I know that despite the deliciousness of pâté, it can’t be that great for you because once again, canned meat is a little freaky. But what about a vegetarian pâté? This pâté is super easy to make, makes a pretty presentation at parties, has a nice refrigerator life and is yummy. My boo thang says it has more of a hummus consistency then pâté but I personally think it has a very pâté feel and does the trick. Unfortunate warning: this is no more healthy then normal canned pâté. I wish it was but the Neufchâtel cheese doesn’t add to the overall healthiness of the recipe. Oh well, it’s a nice alternative to pâté and is great to serve at parties in place of dip and will be gone before you know it. Place beans, Neufchâtel cheese, pesto and garlic cloves in a food processor or blender and blend until smooth. Add salt and pepper and scallions and blend for 15 more seconds. Add more salt and pepper if you think it is needed. Drizzle olive oil on top of the smooth mixture when serving. 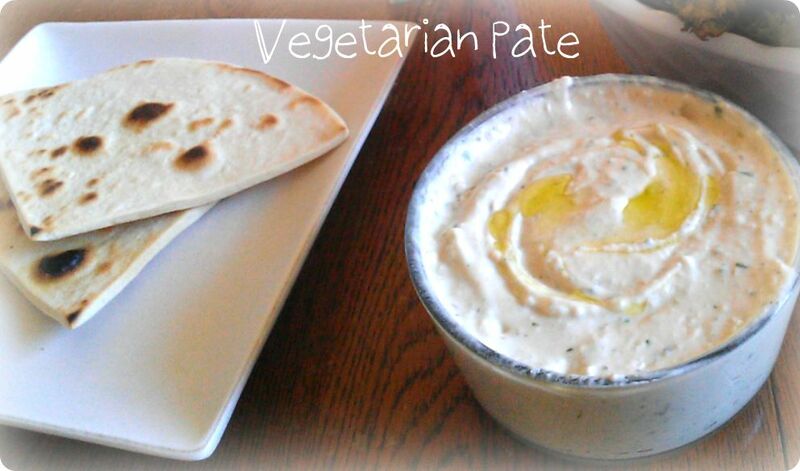 Serve with pita bread, chips or vegetables. I'm a millennial stay at home mom trying to raise 2 kiddos, be a good wife, learn about homesteading, and attempting not to lose myself in the process. I believe in big hair and and live by the 5 (sometimes 10) second rule when food falls on the ground. I'm a hot mess living by the motto "fake it until you make it." Enter your email address and be apart of the hungry yogi journey!